Mission: Supply our customer with a larger bridge to allow service rig and vehicles access. 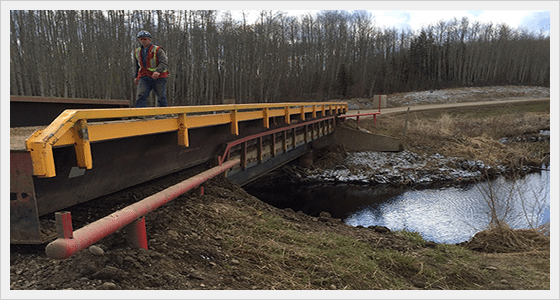 A customer had a 60’ bridge almost wash out from the spring thaw, causing the abutments to almost wash out on a very busy road in the Grande Prairie area. Northern Mat & Bridge came in with an 80’ all steel mod and placed the bridge across the existing bridge. This allowed the service rig and the 100 ton compressor to be able to cross the bridge and have access to the site.